As senior correspondent for Reuters in Munich from 1936-1941, American Ernest Pope saw the cruel and outrageous behavior of Nazis in their native habitat. 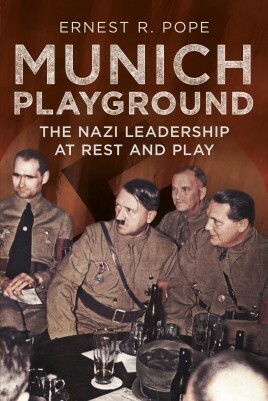 In Munich they ran wild, let their hair down, and indulged in every fantasy money and power could avail them. Pope has all the gossip...and the confirmed stories. "I have seen the leading actors in the Nazi tragedy, playing their parts on the Bavarian stage. Long before the climax-the outbreak of the war-I knew what the denouement in Hitler's theater would be." Pope knew, saw or interviewed all the top Nazis and dozens of lower-level officials, including some of Hitler's security. He saw the Nazis for what they were: a corrupt, debauched, all-too-human menace. Once back in the US, Pope let loose his frustration and ire at what he'd seen-but couldn't write about when he was reporting from Germany. With great humor and fast-paced prose, he writes of encounters with Hitler, Hess, Streicher, and many more. Pope turns his savage wit and erudition on his former hosts. Fluent in Bavarian German dialect, Pope made many friends in Munich with citizens and officials alike. He heard jokes from Munichers that could get them thrown in a concentration camp and he poked fun at Nazis whenever he dared.